Many brands use PoS marketing to increase sales. By providing additional information on the product or even offering product trials (as is the case with perfume samples) PoS helps customers to make more informed purchasing decisions. In many cases it can encourage brand switching and improve customer loyalty. But how to better engage consumers and create an emotional connection to the given product or brand? With digitisation becoming the key tool for engaging consumers, savvy brands are utilising active displays where possible in order to communicate their messages and create an interactive medium for shoppers. An active display creates visual stimuli that makes customers more likely to notice and engage with a brand. Traditionally, glass LCDs are used for digital advertising in shopping malls, airports and on building exteriors, but the use of active displays for small area in-store advertising is rather limited – this may be partly due to the lack of technology that can be seamlessly integrated into the shop environment. The rectangular shape and bulkiness of glass LCDs often make them unsuitable for PoS marketing purposes. Digital advertising shouldn’t be just about showing content on large rectangular screens but should also be able to enhance the consumer experience when interacting with products in store. For example this could be a screen that communicates information on a particular product when the customer touches it. Or, by wrapping a screen around the product (e.g. 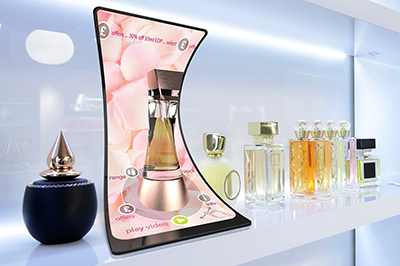 in the form of a display glorifier), the product itself can become an interactive medium that continuously communicates with the consumer through constant updates and personalised messages. This can be particularly effective when promoting premium products. A new glass-free display technology – Organic LCD - can now give an edge to PoS marketing by enabling screens with different form factors that can be conformed to and shaped around in-store surfaces and products. Plastic OLCD offers the same quality in performance as glass LCD, but with the added benefit of being thin, light and conformable. It can be cost effectively scaled to large sizes, meaning that it can be equally wrapped around a large column in a supermarket or a small perfume bottle for example. If you are looking for conformable and shapeable displays for digital signage, please get in touch with us at info@flexenable.com.